Pearl E. Frievalt, 94, formerly of Chiswell Street in Saukville, died November 12, 2011 at Plymouth Care Center in Plymouth, Wisconsin where she had been a resident the past six years. She was born April 21, 1917 in Coleman, Wisconsin to Emile and Rose LaMarshe Sincere. She married David P. Frievalt of Coleman on February 15, 1936 at St. John the Baptist Catholic Church in Coleman. They farmed in Coleman for a while before moving to Two Rivers, Wisconsin and then Milwaukee, Wisconsin. She worked as a waitress for many years while raising her children. In 1979 she moved to Saukville, Wisconsin. Her husband David preceded her in death January 26, 1985. Pearl’s family and faith were prominent in her life. 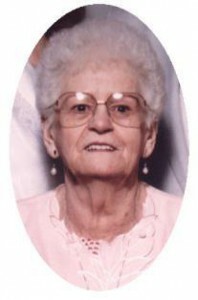 She enjoyed praying the rosary and was a member of Immaculate Conception Church in Saukville. She is survived by her children Ronald (Virginia) Frievalt of Huntsville, TX, Darlene (Roger) Kittson of Saukville, WI, Sandra Schmidt of Sheboygan and Darryl (Carol) Frievalt of Colton, CA. Further survived by 8 grandchildren, 16 great grandchildren, 5 great great grandchildren, other relatives and friends. She is preceded in death by her husband David, children Shirley Ann and Milton David Frievalt, grandson Roger “Bud” Kittson, Jr., sister Ida LaFave and brothers Joseph, Clyde and Ernest Sincere. Fr. Patrick Wendt will celebrate Mass of Christian Burial 1pm Friday, November 18, 2011 at Immaculate Conception Church, 145 W Church Street, Saukville, Wisconsin. Interment parish cemetery. Visitation 11 am – 1 pm Friday AT CHURCH with an 11 am rosary. Memorials appreciated.